These video clips show the various sources of water which people use. Many of the sources are bacteria contaminated and only a few are clean - the ones from water tap and hand pumps. 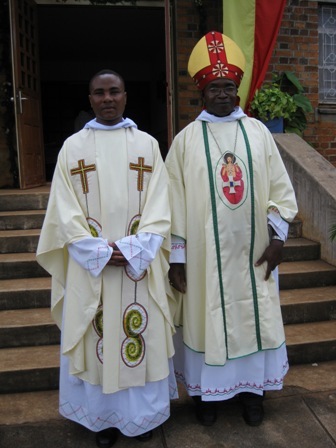 On July 11th 2010 the monks of St. Hanga abbey were happy to receive two young men (Brothers Fraternus Mjwahuki and Bonifasi Sanga) who made their first monstic vows as monks. We welcome them to serve the Lord in God's house of Hanga Abbey. In the photo from left are Br. 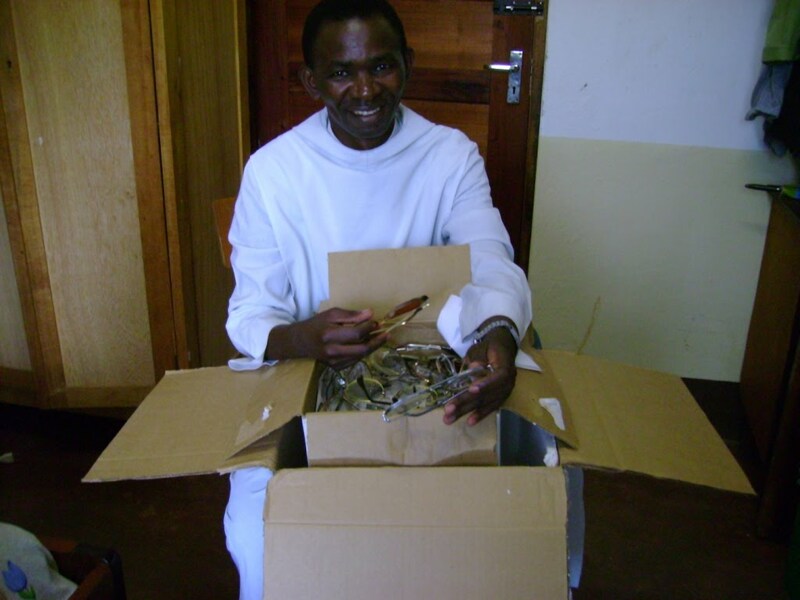 Fraternus, Bishop Placidus Nkalanga, Abbot Thadei Mhagama, and Br. Bonifasi. Thanks to Dr. Ed Tuhy of Klamath Falls, Oregon (USA) who pioneered to collect eye glasses for people in southern Tanzania and began this service at Hanga abbey last year 2009. With basic training to Br. Stanislaus, Br. Benedict and Br. Lucius the service continues. People can get eye glasses after simple eye sight diagnosis. This year 2010 Dr. Tuhy managed to have his friend Dr. Greg from Canada come to Hanga for more help in diagnosing eye problems and giving more training to the Brothers in doing the service. Meanwhile Brs. Stanislaus and Benedict are expected to go to optometry school this September. We cross our fingers because there is only one such school in Tanzania and so chances are very limited. In the photo: left- optometry student from Hollond examines a petient with vision problem. Right- Dr. Ed Tuhy sorting and showing Br. Lucius glasses that he (Dr. Tuhy) brought from USA. Bottom- Br. Lucius is opening a box of eye glasses shipped from the US by Lion's Club in Redding (CA)). In June (8th - 26th) this year 2010 a group of students and professors from Oregon Institute of Technology (OIT) spent time in southern Tanzania at Hanga Abbey and installed three hand pumps to the village of Mputa. They also repaired some broken hand pumps. They were cheered by villagers for the this important service - clean water. The accomplishment was achieved through the group’s efforts to raise funds and the subsidy from Engineers Without Borders . In the photo: a group of OIT professors and students who went to Tanzania this summer 2010 to install hand pumps.